Seismologists at the Alaska Earthquake Center in Fairbanks announced a new magnitude Friday for the Nov. 30 earthquake that shook Southcentral Alaska — it’s actually a 7.1, not a 7.0. The earthquake, the most damaging in Alaska since the Good Friday earthquake of 1964, buckled roads, closed schools, sent a handful of people to the hospital with minor injuries, and caused tens of millions of dollars in damage, some of which still persists months later. Thousands of aftershocks have been recorded. State seismologist Michael West wrote in a statement on the earthquake center’s website that after three months of review by multiple agencies and academic groups, most of the data gathered from the earthquake tilt more closely toward a 7.1 magnitude than the oft-cited 7.0. The revised magnitude arises from differences in how earthquakes are measured, seismologist Natalia Ruppert said. Different institutions might use different techniques or data sets and arrive at different answers. “People should not be too attached to a number, to a certain magnitude,” she said. The 7.0 magnitude the earthquake center originally measured was considered a “reviewed” magnitude, meaning it had been approved by a seismologist. Often, the automatic magnitude generated by algorithms in the minutes following an earthquake is adjusted within a few hours once a seismologist reviews it. However, this new “reviewed” magnitude is technically also considered preliminary until seismologists can arrive at a final conclusion that combines the data gathered, which usually takes months, Ruppert said. This final magnitude is released by a Harvard-based project known as the Global Centroid Moment Tensor Catalog, which Ruppert called the “golden standard” for seismic measurements. The catalog allows seismologists to compare earthquakes apples-to-apples using a single, unified standard. Typically, the final magnitude tends to be the same as the reviewed one, except in “really really complicated” earthquakes, and especially large ones, Ruppert said. The Nov. 30 earthquake was one such event. Because it involved several different faults and a rupture patch that was very long and narrow, there was more opportunity for discrepancy in the measurements, she said. “It’s rather an exception than the rule,” she said. However, the discrepancy between 7.0 and 7.1 isn’t a very significant one, seismologists at the earthquake center said, nor does it change their understanding of what happened on Nov. 30. To put the difference in perspective, seismologists round their magnitude estimates to one decimal place because differences in magnitude aren’t very significant beyond that point, West said. Written out to several decimal places, some of these estimates might look like 7.045, 7.093, 7.105 and so on, he said. The real difference, then, might not actually be a full tenth, but more like “hundredths of a unit,” Ruppert said. “It’s not that much of a difference,” she said. Correction: An earlier version of this story incorrectly described the Nov. 30 earthquake as the largest earthquake since the 1964 Good Friday earthquake. 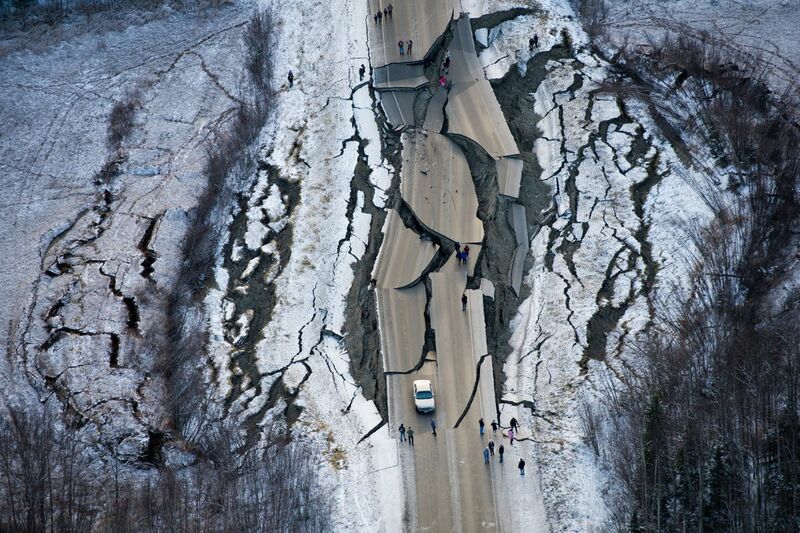 It was the most damaging in Alaska since the 1964 earthquake.